Estimote is a company founded by Łukasz Kostka and Jakub Krzych that has just launched their in-store sensor analytic and customer engagement beacons. Developed in Poland the Bluetooth 4 devices have a range from 4 inches up to 50 meters and are designed to be attached throughout a retail store and on product displays. 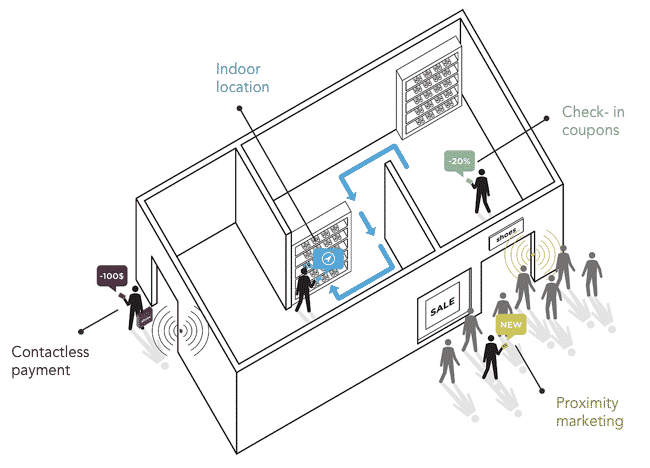 Once up and running the Estimote system can engage directly with a customer through their shopping process and deliver “personalized micro-location based notifications and actions”. These can range from prompting a customer with special promotion as they enter the store or look at a specific product, to personalized messages and recommendations based on their current location or past history with the company. On the retailers end the devices can collect analytics from the sensors so that the information can be used to optimize product placements and track user engagement for specific times of day. Automatic check-ins and payment handling can also be initiated by the Estimote platform enabling interactions where a customer can buy something in the store and have their purchase delivered to their house later in the day. Think about it as a very small lighthouse. Smartphones that are in range are able to ‘hear’ these signals and estimate their location very precisely, as well as communicate with the beacon to exchange data and information. The beacons will ship with a built-in temperature sensor and accelerometer and the team is releasing a developers API and SDK so that a retailer can integrate the interactions into their existing apps for further analysis and engagement tracking. More details about the Estimote platform can be found at: Estimote.com or you can see a sample application of the beacons in a retail context in the video below.